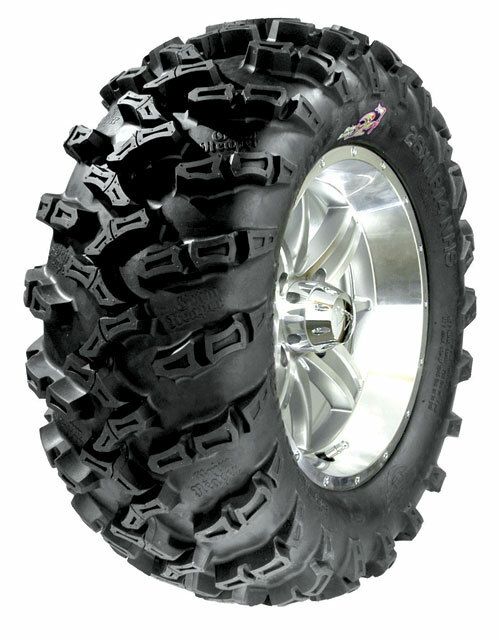 - GBC Grim Reaper ATV tires are sold individually. - In most cases our GBC Grim Reaper tires ship out within 1 business day! My husband and I bought a pair of 2012 KingQuad 400s recently and we switched out the stock Maxxis tires with the Grim Reapers and could NOT believe the difference. They turn better, grip better, ride better, look better, etc. Perfect for any terrain we've thrown at it. There is no 'tractor tire' ride to these tires either. You can't go wrong with Grim Reapers. 8 ply radial, awesome tread, and perfect price point. I researched what I wanted on YouTube from pureoffroad. The videos were very helpful in helping me make up my mind. I wanted a more aggressive tread than the stock tires, but didn't want the giant lugs on some mud tires. I paired these with the ITP 212 machined wheels and they look awesome on my Grizzly. These tires will take you anywhere you wanna go and back again. The guys at pureoffroad were awesome. Buy with confidence. I was very impressed with these tires /Thay are verrry agressive they hold great. They have a lot of road noise but if you were to expect anything different then obviously you have no experience with this type tire !!!! The fast shipping & customer service from pure offroad is unbeatable / You will not be treated better [ fairer ] anywhere ! Do not hesitate to deal with these guys & buy you some Grim Reapers !!!!!!!! I bought 2 tires (Grim Reaper) from Pure Offroad. The tires are great and the service was GREAT? I will be ordering 2 more this spring. Thanks Pure Offroad for the great job! First of all I would like to thank Pureoffroad for lightning fast shipping. The GBC Grim Reaper tires are amazing, digg like a tractor and are super tough. 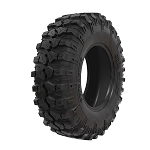 They are an 8 ply tire and I thought they would be a stiff ride, but even on my 11 Recon they provide a fairly smooth ride and look amazing, I would highly recommend this tire to anyone who wants bullett proof tires for there ATV. Haven't had the chance to try them out yet on the trails but man do these tires and wheels look good. I suspect these tires will do extremely well in light mud and trail riding.Didn't realize the tires are directional tires and 3 tires were all mounted in the same direction. Called PureOffroad and they instantly took care of problem. Great all around tire! Light weight and 8 ply. Put these on my xp turbo and couldn't be happier! Ordered product and it actually arrived much sooner than expected! Packaged great and it was exactly what I ordered. Great service from Pureoffroad, as usual! It's a great Tire works perfectly and all-terrains rides nice on hard services I will buy these again. 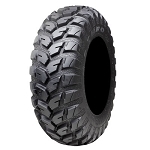 Awesome tires for my Polaris EV. Fast shipping and good price. Strong tire with great traction and smooth ride. Sales staff at Pure Off Road was great.The Grim Reaper tires work great on my Suzuki mini truck. Hardly need 4 wheel drive. Fast shipping!!! Purchased these tires & then went on a 1200Km trip around the Gaspe, Quebec. Very pleased with the handling, traction, puncture resistance, & ride. Would definitely recommend these tires......far superior to OEM that came on my side by side. Mounted them on the new rims and they are great. Handling is excellent. Grim reapers are one of the best looking tires out there and on top of that, one of best performing.They are great in everything especially mud!! Pure off road staff was great with fast shipping. Had some concerns about the height of the tire but once mounted they were fine. Pleased with the performance of the tire and looks great! I got the grim reapers for my 2014 Polaris ranger xp 900 this is such a great tire for all weather, ride is great made such a big difference then the stock Carlisle tires, looks great on my ranger and is a true 27 inch tire. The staff at pure off road is the best. and very fast shipping thanks to all at pure off rd. Ordered the tire & wheel kit with grim reapers and STI HD3 wheels for my Ranger on Fri and recieved them the following Tuesday. Awesome looking setup!! !Customer service was friendly and helpfull. Even sent me a free T-shirt. I have had these tires on my 1999 Yamaha Kodiak 400 for about two months now and have driven about 200 miles. I must say the handling is a lot better and and they bite hard. A lot thicker lug then what the picture looks like which I like. The carcass is very thick, and seems to bed tough. The ride is very smooth and comfortable. Thanks pure offload for the extremely fast shipping. Great and tough tire also pulls very good in the mud. Best atv tire I've ever used. I have a set on a ranger and a set on my mini truck. In both applicatons they do great. Tires are great and they were shipped super quick !!!! Got these tires to go with new ITP SS112 wheels and the setup looks amazingly good on my machine. These tires are a huge step up from the OEM tires that came on the quad. I noticed an immediate increase in traction and I've been plowing snow without any difficultly at all. Very nice tires, good grip and thought. Highly recommend. Service was great and very fast delivery. I just purchased a set of grim reapers tires and M 12 wheels and I really like them. Service was excellent. I really like the looks of the Grim Reaper's that I recently bought. They improve my UTV's appearance and they give the desired extra clearance gained from going from a 23 inch tire to a 26 inch tire. While it isn't "muddin'& huntin'" time yet, I'm sure that aggressive tread will do what I want. Special thanks to the folks at Pure Offroad for helping me get the right size and for the speedy delivery. The Grim Reaper tire 8 ply rated exceeded my expectations and made me a very happy man. Put them on a 14” ITPSS12 Machined Wheel and you have one beautiful, incredible, absolutely solid combo. Great service great prices no sales tax no shipping could not be happier. Thanks Pure Offroad a pleasure doing business with you! I looked for tires on a lot of sites including pure offroad,they have tires that you don't find just anywhere,at the lowest prices. I ordered 25x10x12 Grim Reapers for my 850D J.D. Gator. Delivered in 2 days.Steers easier,rides smoother, and better traction. I would recommend pure offroad to anyone looking for great tires & service. Very happy with the Grim Reaper tires vs the stock Big Horn. was very pleased with ease of ordering. one tire would not hold air. called and was told if i could not get it to hold air call back and they would send me another rightaway. was goin to hatfield macoy w.v got tire fixed at an atv dealer down there. am very happy with these tires and rims.they are truly awesome! if you are thinking of getting them just do it.i read tons of review's never a bad thing said by anyone!have them on a outlander 800 xxc they handle better than i could have imagined! After watching myself and some of my buddies shear and puncture holes in tires on our golf carts every other weekend, These were a refreshing answer for the rocks,wood and mud. I would like to tell everyone thinking about the purchase of this tire it is by far the best atv tire I have used. I don't know if the 8 ply or lower profile sidewall makes the difference. But I have installed these on both a 500 sportsman and a 700 ranger. I hunt 3 months a year and have gone through I don't know how many ties due to rock punctures or just basic tire design. These are really well built and gripping tires. Thanks to all the staff at Pure offroad great site, great service. Rode with machinces that had mud lites, dura grip, big horn. They had to use 4x4 up clay hills. The grim reaper walk right up in 2wd! Best tire for your $$$. They are the only tire I will run on my 800 Renegade now as they are the only tire to hold up to lots of abuse. Smooth ride, great traction on dirt and in mud. They hold up to rocks much better than OEM. Will be ordering more soon, as the Outlander is going to need a set. We got the tires ahead of schedule. Last weekend we went to Haspin Acres in Indiana. The grim reaper tires I purchased for my 350 wolverine were outstanding. I had no problem navigating the turns and hills. we even hit a few of the mud holes with them. If your looking for a great tire on the trails, or road these are it. I spent some time looking for a replacement tire for my 450 and son's 350 Wolverines. There's not a lot of choices for a tire with an aggressive tread. The Grim Reaper seemed to fit the bill. Couldn't be any happier. Great on soft trail, hard pack, even asphalt. Haven't tried them on the beach sand yet. Highly recommended. We have the new tires mounted on the bike and they really look good but we haven't had a chance to try them out yet. We do appreciate the fast service, delivery and follow-ups from offroad. Refreshing change from the customer service that you do not get from most companies. FIVE STARS!!!!! Purchased these as a replacement for a factory set of tires and did they give my machine the WOW EFFECT! Just can't ride in my yard anymore because the tread design is so agressive it really digs up the yard! What can I say....the Grim Reapers worked flawlessly on my trip to Brimstone last month. Wouldn't say they were deep mud tires, honestly, I avoided the real deep stuff as my Grizzly was only a month old at that point. The rocks and hilss and mud tho were no match for the Reapers! The videos on Youtube from Pureoffroad.com was VERY helpful in making a great choice in a tire that fit the needs and demands for my UTV. The Grim Reaper is a excellent Radial tire. Great traction and very smooth riding on paved roads. 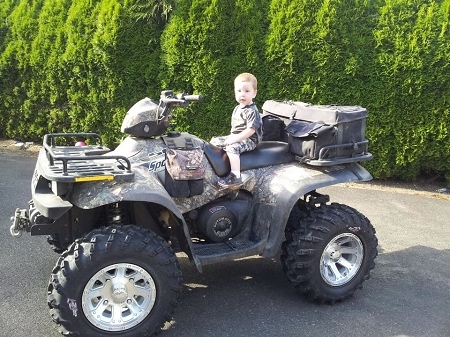 Im ordering another set for my ATV. Great tire- I ride in rocky terrain and these tires hold up to the abuse well. Q: Have a can am 650 xt with 26x8-12 fronts and 26x10-12 rears. Pros or cons putting on grim reaper size 26x10-12 fronts with 26x12-12 rears? Or should I go with 26x10-12 all around? A: From what I'm hearing a 26x10-12 will not fit on the front of your Can Am unless you have aftermarket wheels and/or wheel spacers because they are too wide. I would recommend finding another tire that comes in 26x9-12 instead so you don't have any rubbing on the front end. I prefer to run skinnier tires up front and the wider tires on back. It handles better and looks better in my opinion. Some people like to run a skinny size all the way around so you can rotate them and the skinny tires cut through the mud better. It just depends on what you are using your machine for and what your preferences are. Q: Will a 26 x 11 R12 fit on a 12 x 7 rim? Q: Looking at the 26x9x12's (front) and 26x11x12's (rear). Stock tires are 25x8x12 and 25x11x12. Question is, will I have to use spacers on the front of my 2015 Midsize Ranger 570 to be able to use the 26x9x12's? A: Hi, The sizes you are looking at will fit on your Ranger just fine. No spacers needed on the front or rear. A: The grim reapers are excellent all-terrain tires. They aren't designed to be driven on the highway but if you need to occasionally drive on the blacktop they hold up very well. They are also offered in the sizes you need for your wildcat. Let us know if you have any other questions. Q: what is deepest tread depth.? looking for around 1.25 in. in 26x9-12 frnt. 26x12-12 rear. i also like the ams xt slingshot. but did not see it hear. also looking for 25x8-12 frnt. and 25x10-12 rear. deep tread. but smooth ride for wife's atv. ride mostly hard trails. with occasional deep sloopy mud. A: Yes, if you are running aftermarket wheels. If you have your stock wheels they will most likely rub because your stock wheels don't have enough offset to them. Q: What is the load rating for these tires? A: Each size has a different rating. Which sizes you you looking for? Q: Will a 26x9x14 grim reaper on a 14x8 wheel work all the way around on my 08 Suzuki 450 king quad? Q: Hello: We are running Kubota RTV 1100s in off trail conditions where we are loaded and towing up to about 700 lbs. We collect data with these machines and go in a transect pattern, like mowing a lawn. This causes the sticks and debris that we just rolled over to be pointing directly at us when we come around in the opposite direction. The stock tires continually puncture and we were looking for a tougher solution. We operate in all kinds of condition from grass and brush, to dessert, to mud as well as sand. We are looking for a tire that is more resistant to puncturing. I see that this product is a radial tire. Does this tire have steel belts, or is it simply reinforced? Is the best choice for our application that I listed above, or do you have another suggestion? Thanks for your help. 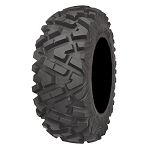 A: This tire is very tough and is very popular in the ATV market. For what you are doing I think it would work ok but I personally would recommend one of our run flat tires. They are the toughest tires we carry. Check out the DWT Moapa run flat and the Sun F A-033 run flat. They are both 12 ply tires that can literally run without any air. They would be ideal for your bigger heavier machines with a big load. If you decide not to go that extreme I think you would also be happy with these grim reapers or you might also conside the GBC Dirt Commander. We have a lot of customers that run the Dirt Commanders out in the oil fields etc.. on their Kubotas. Let us know if you have any other questions. Q: Which size tire and wheel would you think look the best on a 2016 Ranger 900 crew? A: If you don't have a lift kit or forward A-Arms you will need to go with 27 inch tires. Anything larger than that will not fit on your machine without rubbing. I would recommend 27x9-14 and 27x11-14 tires on any set of 14 inch rims. A: Yes you can run 26x11-12 for all 4 on the back and I would recommend running the 26x9-12 on the front. If you try to put the 26x11 on the front you will most likely have some rubbing with your stock wheels. The larger tires won't hit each other on back as long as you only go to the 26 inch. Let me know if you have any other questions. Thanks!